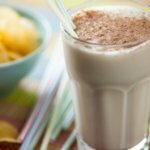 This tasty and sweet banana smoothie is good for breakfast, either as a light breakfast in its own right or as an accompaniment to toast, cereal or pancakes. We are using bananas, milk and sugar to make it, along with ice cubes to chill it. This recipe is a good way to use up over-ripe bananas if you don't want to make banana bread or banana muffins. This sweet banana smoothie recipe allows you to tweak the ingredients depending what you want to throw in there. Swap one of the bananas for a handful of hulled strawberries or a chopped peach, or any other delicious fruits you want to add. If you want to make it more filling, a tablespoon of peanut butter is good in here too. Smoothies are popular, just like juices, but with a smoothie you get all the fruit, not just the water content, which is why smoothies tend to boast more nutrients (and fibre) than juices. They are better served as soon as they're made, so the ingredients don't separate. This recipe makes 4 regular servings or 2 large ones. If you prefer not to add the sugar to this sweet banana smoothie, you can leave it out and it will still be sweet because of the fruit. Alternatively you might prefer to use artificial sweetener, agave syrup or honey in this smoothie if you want the sweetness without the sugar. 1. 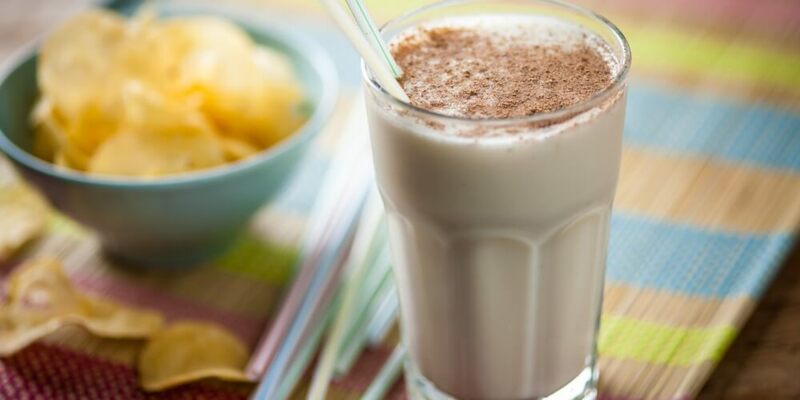 Put the milk and bananas in a blender. 2. Pulse until the bananas are chopped. 3. Now add the sugar and water. 5. Toss in the ice cubes. 6. Again, blend until smooth. 7. Divide the smoothie between 4 glasses and serve right away.